A magical region enshrouded in the mists of the past, Aizanoi whispers the secret of the stones to visitors to Çavdarhisar in Kütahya province. Situated on the threshold of West Central Anatolia amidst the mountain masses that divide the Aegean region from the Central Anatolian 'bowl', Kütahya is thought by many to be devoid of touristic attractions. Not so! Host to the Valley of the Phrygians, the Germiyan Houses, an Archaeological Museum, tile workshops, the Gölcük Highland, the Domaniç Forests, natural thermal spas and, perhaps most important of all, to the ancient city of Aizanoi, dubbed Anatolia's 'second Ephesus', Kütahya is the ideal destination for an out-of-the-ordinary holiday. Although it appears on paper to be a township, Çavdarhisar, fifty-seven kilometers from Kütahya, is actually more of a typical Aegean town. Turning off the main hghway, you have to stroll down a pleasant road lined on both sides with trees and flowers to reach Aizanoi. Standing smack dab in the center of Çavdarhisar, Aizanoi is known by various names such as 'Ayzonayi', 'Ayzanoy' and 'Ayzene'. 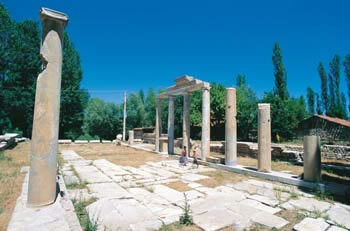 The ruins of the ancient city seem to have been scattered carefully amidst fields, gardens and greenery. 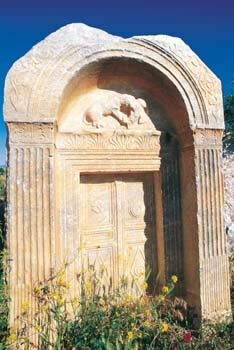 Apart from being the seat of a bishopric in Byzantine times, Aizanoi, which enjoyed its most brilliant period in the 2nd and 3rd centuries, is historically significant for possessing the best preserved Temple of Zeus in Anatolia. Not only that, ruins of a large theater and attached stadium, two baths, one of them paved with mosaics, five bridges, two of them still in use, an ancient dam, colonnaded streets and burial grounds are among the remnants of the town's past. The city's name is thought to derive from a mythological hero by the name of Azan cited in the ancient sources as an ancestor of the Phrygians. 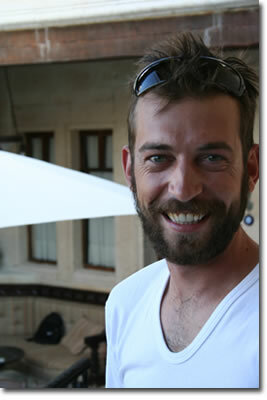 Described as the fruit of the union of the water nymph Erato and the legendary king Arkas, Azan lived near a cave on the upper reaches of the Kocaçay River. Excavations carried out around the Temple of Zeus on the high plateau of ancient Aizanoi have uncovered evidence of life dating back to the 3rd millennium B.C. 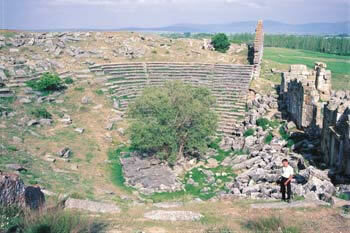 Attached to the Pergamon Kingdom in the Hellenistic period, the city fell under Roman rule in 133 B.C. 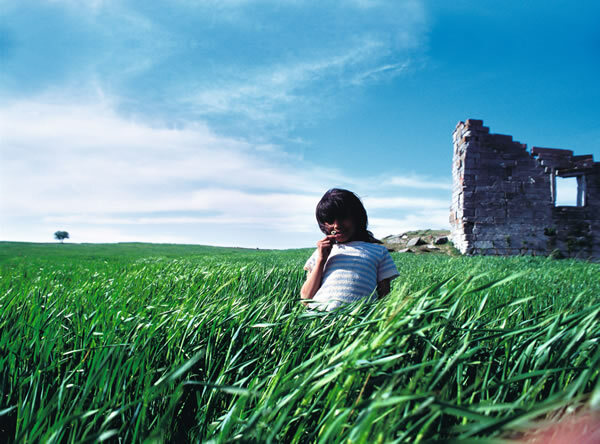 Thanks to the production of grain and wool it grew wealthy in this period when its fame exceeded regional boundaries. While Aizanoi was the seat of a bishopric in the early Byzantine period, its importance began to wane from the 7th century onwards. 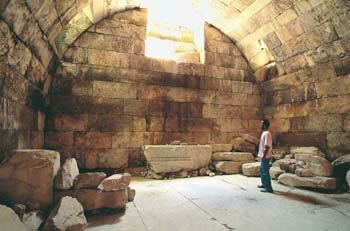 In the Middle Ages the temple platform was transformed into a citadel ('hisar' in Turkish). Captured by the Seljuks in the Middle Ages, Aizanoi was given to the Çavdar Tatars and from the 13th century onwards was known as Çavdarhisar. Centuries later in 1824 Aizanoi was rediscovered by European travelers, and the excavations first undertaken here by German archaeologists in 1926 continue apace today. But the residents of Çavdarhisar are not particularly pleased that their village has been turned into an official archaeological site. İsmail Hakkı Dede complains bitterly of the fact that residents cannot even drive a nail into the wall even as families in the village are growing steadily bigger. While elderly men playing cards are fixtures in the village coffeehouses, raw youths in the first flush of manhood yearn for the big city while children play in the streets and the women either chat in doorways or toil in the fields. The concerns of the young men are the usual: joblessness and the price of sugar beets. Catching fish on lines or with nets on the banks of the Kocaçay, little boys contribute to the domestic economy. 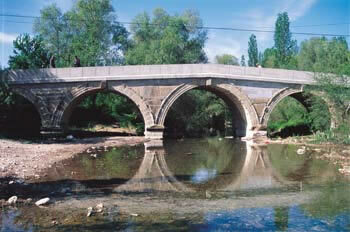 Two of the bridges that joined the opposite sides of the town in ancient times are still in use today. 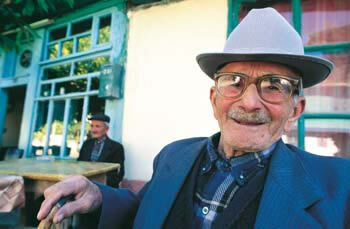 Despite an ancient jewel like Aizanoi in their midst, the villagers of Çavdarhisar lead a humdrum existence. 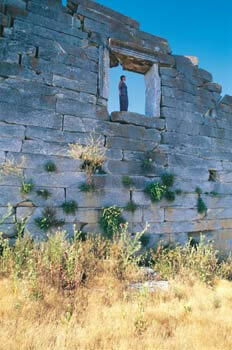 Treasure hunting, countless examples of which can be observed all over Anatolia as the simplest solution to economic despair, has resulted in damage to the ancient ruins here as well. Nevertheless, their greatest treasure stands right in the center of their village! The new generation of inhabitants has realized this and created websites about it, flooded the press with news and invited prominent figures here to promote Aizanoi and keep it alive. 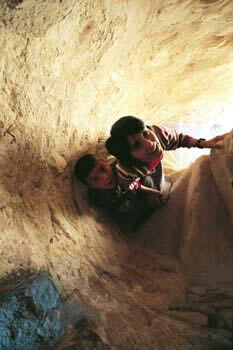 For the younger generation, well aware that the future of Çavdarhisar lies in Aizanoi, dote on their ancient stones. 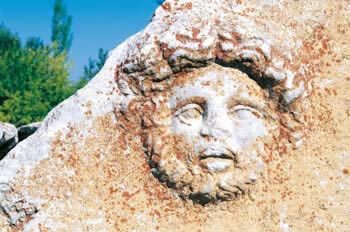 They know that the day will come when Aizanoi will rise again and Turkey will gain a second Ephesus. The size of the necropolises that surround it give some idea of how big the ancient city of Aizanoi was. Çavdarhisar may appear to be a small town, but Aizanoi was a large and imposing city in its time. Bridges, a Temple of Zeus, a marketplace, colonnaded courtyards, baths, the ruins of a mysterious circular structure, a stadium, an ancient temple, a marble paved avenue, the city gate, burial grounds and sacred precincts... whatever you desire of an ancient city, it's all here. Since the area around the galleries which are said to have been the market and commodities exchange of their time is not separated off by a fence of any kind, it forms a picture of complete overlap with the village houses. Indeed the villagers have enlisted some of the columns as seats and others as tables. The locals have also dubbed the street with the ancient 'stock market' Taksim Caddesi after the famous square in downtown Istanbul. Not only that but there is another street known as the Yüksek Kaldırım, a clear indication of the residents' yearning for the big city.